What to You Do When You Get an Interested Reply to Your Cold Email? For many people, the process of getting a reply to a cold email can be long, hard, and a little discouraging. You spend so much time getting the right prospects, researching each to help make your email more personalized, finding their email address, and constantly following up until you get a reply. More than selling a product, service, or brand, the main goal of any cold email is to convince a prospect to reply. And that can be the hardest part of all. But when you finally get an interested reply to a cold email, it makes the whole process worth it. This is the moment you’ve been waiting for; the reward for all your time and effort. But the hard work is not over yet! As soon as you get over the initial excitement, you actually have to come up with a response too. Your reply should be compelling enough to keep the conversation’s momentum going. So, a prospect finally said yes to your pitch? Good for you! But once the party calms down, you’ve got stuff to do. Start off by actually reading the prospect’s answer. Try to read it and understand it with the aim of getting a grasp of what they expect from you. Does the prospect have all the information they should be provided with? Has the prospect been to your website searching for more information? Do you think that they understand exactly what you’re offering them? Do they have some additional questions or doubts? Is the prospect currently using a competitor’s products or services? Are you sure that they are your ideal prospect? These questions might seem like a lot, but they are very important. You have to ask yourself some of these when talking to your prospect – literally put yourself in their shoes. This is the only way to get the answers you need to make your response to a reply to a cold email helpful and relevant. When it comes to cold email follow up, the timing is crucial. You should never leave the prospect waiting for too long to get a reply. In fact, if you can respond within a few minutes of their reply, you’ll earn some extra points and impress them right from the start. Why is the timing so important? Ensuring that your responses are prompt is a great way of creating a sense of a real person-to-person conversation. You’ll leave the prospect knowing that, yes, there’s another person on the other side of the screen ready to talk to them. And creating that personal touch is the first step in winning the cold email game. These days, very few companies respond to emails within a few minutes. And when it happens to you, how does that make you feel? So, a quick reply will help you stand out from the crowd even further. It shows that you’re really interested in having a meaningful, long-term conversation with them that could lead to some mutual benefits. It’s also a great way to make the conversation dynamic and build upon the “in” or attention that the prospect has just given you. Again, start thinking like the prospect. They’ve just seen your email and taken it a step further to check out who you are or your company website. Now, they’re interested and may have some questions or thoughts for you. So, they really do deserve that reply now – not two or three days later! That’s why it’s incredibly important to send your cold email messages during your working hours. Some marketers and salespeople try to use timings that correspond to the prospect’s time zone. If you do this too, you’ll obviously be unable to respond to any replies to a cold email as quickly as possible. Instead, use your own working hours as the basis for timing your email campaigns. This approach will increase the chances of you getting a reply at a time when you’ll be able to continue the conversation immediately. From the moment you get a positive reply from a prospect, your mission is to help them reach a specific business goal with your product or service. And in order to provide value and give them the best help that you can, you need to know as much as possible about their company. Look into their business goals, core service or product, target demographic, workflow, company culture, and anything else you can think of to help you do this right. Don’t get too excited about the reply and think that now is your chance to get into all the awesome features of your product or service. Remember, the only way to keep a conversation with the prospect going is by listening and learning as much as possible. Listen so that you know what the need, and learn so that you know how best to respond to their needs. Give the prospect a chance to build some individual context for your ask. This point is related to the one above. If you personalized you cold email enough to get them to respond, then there’s no excuse to use copy-paste templates in any further messages. Cold email templates are great, but it’s only customization and personalization that makes them effective. Never lose sight of this fact. So, the bottom line is that all your emails should have that personal touch that the prospect has come to expect from the first one. They should always feel like they’re talking to a real person, not some computer-generated robot. The hardest thing to do after receiving a reply to a cold email is keeping the conversation interesting. It’s not to overwhelm the prospect with too much information! You might be tempted to send them a full pitch with all the features of your product or service listed while attaching a cool infographic, Powerpoint presentation, and in-depth PDF. Resist the temptation because it will only do your efforts more harm than good. Sure, the prospect replying positively to your cold email gives you an opening to send them more information about your service or product. But go too far and it will be too much for the prospect to process. Your job is to learn their specific needs before sending them anything. As soon as you have the exact context, you can then tailor your email to match it. You’ll be able to pick out the most relevant features of your pitch and highlight the benefits that would be the most appealing to the prospect. That’s because the most effective offers are perfectly adjusted to meet your prospect’s individual business goals. If your opening email successfully leads the conversation and you stay focused on your prospect, they will get back to you with some specific questions about your pitch. When that happens, it is incredibly important to give them all the answers they need in your subsequent email. Alternatively, you could also ask them more questions if you need clarification on any requests. Never try to avoid answering the questions in a cold email reply just to corner the prospect into a call or meeting. This move may just irritate them or scare them off. If you try to push a prospect that’s not ready for a meeting or phone call into one, you’ll just lose a prospective customer. So, it’s okay to keep your email conversation going for a longer time if that’s what the prospect needs. And when it’s time for a meeting or phone call, you’ll just know that too. Don’t try to force anything. Now that you’ve gotten a reply, don’t try to go straight to closing the deal. “Investigate. Learn. Listen.” That should be your mantra throughout the email conversation. Because if you’re selfish and pushy, you’ll essentially be denying the prospect a chance to make a genuine buying decision. And that’s not a good move if you want them to keep on buying into your product or service, is it? If you try and force the prospect to buy, there’s a high chance that they won’t really feel a need for your solution. That’s not the way to get a loyal customer. Instead, your role as a marketer or salesperson is to make potential clients feel that they want and need your product or service in their life. The best way to do this is by focusing your email conversation on their needs. Show them how your product or service works. Show them how it can make a certain process in their business run more efficiently. Go as far as to lead them to case studies of your existing clients if you have any (which you should), to provide value. Simply put, the most effective salespeople are those who are the most helpful and considerate. Thanks for your reply. It’s great to see that you’re interested in (your product/service). Here’s the link to the signup page for our free trial. If you have any questions, here’s my calendar. Wait, what just happened? You’ve worked so hard to start an email conversation with this prospect. You’ve sent them a targeted and personalized opening email, a couple of follow ups and have been waiting patiently for their reply. And once they do, you push off all the work on their shoulders? Nope! That’s not the way to act after a reply to a cold email. Sure, some prospects do like to proceed by themselves. They’ll do the research, sign up for your demo or free trial, and even schedule it on your calendar. But the majority will simply give up in the face of all that work. When an outbound lead shows interest, you should never turn your back on them. It just shows that you’re abandoning all possibilities to have a meaningful conversation, learn from them, and build a strong business relationship with them. It is important to note that, when you get that first reply, the sales process has barely just begun. Don’t drop the ball now! You need to put in some extra time and effort to nourish your budding relationship with the prospect. Cold leads, in particular, need a lot more attention. That’s because they are usually in a different stage in the buying process when they start an email conversation with you. They are at the very beginning. That means they don’t know anything about you or your brand. They haven’t even started doing their research yet, so they don’t know how exactly your product or service is going to help them. With that in mind, you’ll understand why your job at this point is to take them by the hand and show them what you’re all about. You need more information about them in order to actually help them and sell to them. And the only way to get it from the prospect is by actually engaging them until they are ready to buy. In every relationship, it’s important for both parties to know what to expect from each other and when to expect it. This is even more vital when you’re starting an email conversation with a promising customer. So, all your emails should end with a well-defined call to action. Simply put, this means that you must define what the next step is. Do you want to send them more material? Or, do you need them to give you some information in their next reply? Whatever the case, it is important to tell the prospect exactly what you’re going to do. You should also establish what you would like them to do before your next contact. This approach allows you to control the flow of the conversation and ensures the prospect always knows what to expect next. If you follow the bad example we used in the previous point, then you’ll lose all the control that you’ve worked so hard to establish. And, unfortunately, it will be very hard to get it back. So make sure that the prospect is never caught off guard when you send another email or call them. Also, ensure that you don’t keep them waiting too long for you to actually accomplish what you promised to do next. The most successful sales tactics all rest on one thing: relationship. Your sales process shouldn’t be about just sending a single email to a prospect. It even shouldn’t revolve around a couple of back-and-forth emails. Instead, your focus should be on continuing to build a meaningful relationship with prospects on other channels too. LinkedIn is a great tool for this. You have all the promising prospects all connected in one place. So you should use the platform to network and generate even more new leads. You can also use social media platforms like Twitter to track current customers and prospective ones. The best thing about social media is that it helps you learn more about your customers, their interests, and their needs. It also gives you a valuable chance to interact with them outside a “sales” setting. So it is important to leverage the opportunities that social media presents you with. Starting an email conversation with potential customers is just the first step of the sales process. You will also have to do a lot of follow up actions such as subsequent emails, phone calls, meetings, and even demos. But in order to be effective, you will have to set a strict schedule and stick to it. If you say that you’ll email a prospect back on Wednesday, then you had better send that email by Wednesday. A great way to keep this strict schedule is by using an email automation platform. If you’re not using this one already, now is the time to sign up for one. Running a cold email outreach campaign on a platform like RooJet will make the whole process easier. RooJet helps you automate your follow up, ensuring that you respond consistently and always on time. It will also save you loads of time and energy as you start responding to emails from your prospects. But while it can be tempting to build a list that can respond to all your prospects at the same time, it’s not a good idea for your long-term success. Remember, the goal is to keep it personal and focused on your prospect. And that’s pretty hard to do if a customer gets a generic message after their reply. It’s fine to use an email automation tool as long as you ensure that you tailor each message to the specific prospect. 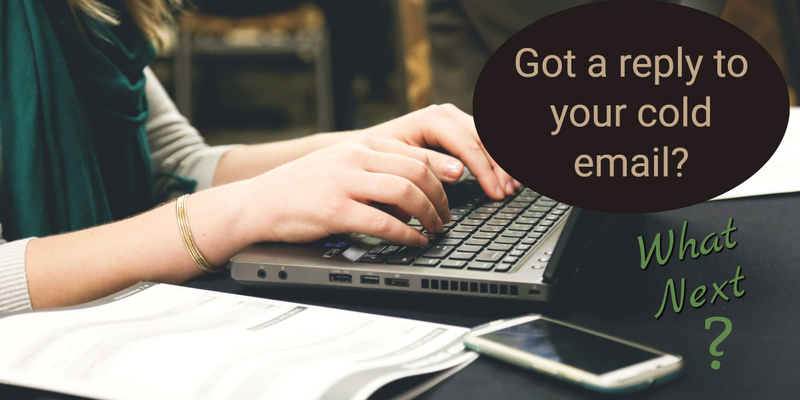 Email templates are a great way to get inspiration for your next message to a prospect. This is especially important if you’re at a loss for what to say after a reply to a cold email. You can use personalized triggers, case studies, and testimonials from previous clients to show a prospect exactly what your product or service can do for their business. Thanks for taking an interest in (mention your product/service). I’m excited to learn more about your (mention specific challenge/concern) at (name of prospect’s company). I’m happy to answer any questions you might have about (name of your service/product) and how it can help you (mention specific benefit). Can we touch base over a quick phone call on (mention specific date and time)? Since you’re interested in this, are you open to chatting more over a short 10-minute call on (mention time and date)? Or, if you’d prefer, I can send you some more detailed information on this. Let me know! I really enjoyed our meeting/phone conversation earlier today. I especially liked learning about your unique role at (name of prospect’s company). I feel now that I have a better understanding of the challenges you’re facing with (mention challenges discussed) and the impact they’re having on your company/department/sales etc. As promised, I’ve attached/linked to some resources that can help you understand how (mention your service/product) can help you (insert compelling reason to buy). Let me know if you have any questions. If not, I look forward to talking with you again on (mention specific date and time). The key to successful outbound outreach is learning and experimenting with new things. That’s the only way to know what works and what doesn’t for your own email campaigns. But the learning process shouldn’t just end at the point where you’re still crafting your cold email campaign. But it’s also important to remember that you have to keep prospects interested in talking with you. That way, you’ll increase your chances of getting a reply to a cold email. You will also be able to listen to their needs and understand them better. This will ensure that you can tweak your pitch well enough to convince them to buy into your product or service.